The first season ended just last week, and PlayStation has already pulled the trigger on a second year of its debut original drama Powers. Spoilers ahead for season one of Playstation’s Powers! Based on Brian Michael Bendis’ long-running comic series about cops trying to keep the peace in a city filled with superheroes, the 10-episode debut season was somewhat uneven but showed occasional flashes of brilliance. It seemed to hit its stride toward the end, though, so here’s hoping the creative team can build on that momentum in season two, which has just been confirmed by The Hollywood Reporter. 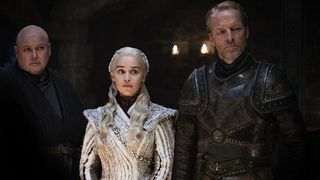 There's no word on exactly where they’ll be taking the story in year two, but SPT studio president of development Jamie Erlicht teased that they plan to “broaden the Powers universe” while introducing “more fan-favorite characters and storylines” next season. Considering that the first season ended on one of the most iconic moments from the comic (which actually came in the first issue of the comic), it stands to reason the murder of Retro Girl will certainly play a key role. As for introducing more fan-favorite characters? Well, they have more than a decade of comic lore to draw from, so there are more than enough stories to retool that could work for television. Much as AMC did with The Walking Dead, the creative team behind Powers has reworked elements of the comic to create something similar but wholly unique for television. So, even if you’ve read the comic, the show can still surprise you. Though the first season wasn’t high art, it was a fun romp into a unique comic-book world that put a new spin on some of the most dated superhero tropes. If they can keep trending up, we’ll definitely keep an eye out for this one in 2016. Are you glad to see Powers score a season-two renewal?